Say hello to EJ. He wears a helmet, few people even know what country he’s from, he DJs to crowds around the world and regularly plays to audiences of 20 million people. But unless you’ve been bitten by the Formula E bug, there’s a strong chance he’s not on your radar. Get up to speed (no pun): Formula E is a new electric motorsport that takes place around the world on temporary innercity tracks. Due to the cars being electric, music and sound effects have played a key role in the sport from the very beginning. And the mysterious EJ is responsible for those sounds… Sounds which over 20 million people enjoy when they’re tuned in to the race on TV and online. Now, with several Oliver Heldens-supported releases under his helmet, EJ is becoming more recognised as an artist in his own right, too. This weekend he’s playing at Ultra Europe and is set to perform more electronic music events during the break between Formula E seasons. So… You’re in a unique position to say the least! Yeah it’s 100 percent unique. I’ve been working in dance music for a number of years now. I’ve worked at Ministry Of Sound and a lot places in Ibiza. 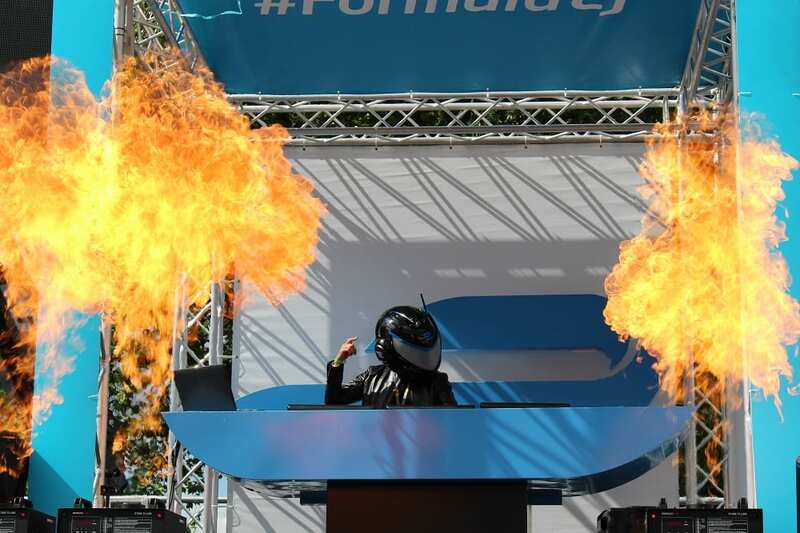 When I was asked about what type of role a DJ can play at Formula E I was instantly sold and we started developing the EJ persona to build along with the sport itself. There’s a cool futuristic sci-fi spin to it with little nods to Tron, Daft Punk and even a little deadmau5. We’re trying to get away from the gimmicky aspect of it, though. The Formula E championship is so special that the primary focus is to represent the sport with the right music and enhance the whole experience. If EJ, as a character, gets booked for DJ slots outside of the sport then it’s a bonus that helps highlight the sport. Now, two seasons in, we’re noticing this is happening – I’m being booked outside of the sport which will hopefully attract more people to Formula E.
Exactly. All the elements of Formula E work together; there’s the high-tech side, there’s the sustainable energy side and the music. And that’s all before we get to the actual sport itself. All of it should complement each other. We’ve got a virtual gaming championship, too. Music has been a big part of it for the start; creating our own music so it sets a real tone and theme that’s unique to build up of the event and also entertaining the crowds with our Formula E Music Stage with Visa and guest DJs like Eric Morrillo. Music and sport have always been closely related but this is the first time a sport has been intrinsically linked to music from the very start. Yeah it’s incredible isn’t it. I’ve been involved from the very start in 2014 writing the music with producers to create the theme tune and all of the music that gets played in the replays. There are sound effects such as the fan boost sound and there’s the music for the highlights. Then there’s the actual dance productions which is more like the stuff I play when the race is on. There’s so many opportunities to soundtrack the sport. What’s this fan boost all about? The fans can influence the sport by voting for their favourite driver; the top three drivers who get the most votes get an additional boost in power to their car. Essentially if something isn’t going a driver’s way then fans can make things happen for them. It’s like changing the goal posts, but legitimately. Completely. This is interactive sport which really engages people. And, of course, while the race is going on I’m DJing and soundtracking the experience. The cars are silent so we’ve installed soundsystems all around the track so if you’re sitting in the grandstand you get the rumble of the music to compliment the futuristic sound of the cars! So we do the build-up while the cars are on the grid and then when the race starts I go into a one hour mix. I also implement sound effects for what’s going on. So if there’s a yellow flag I’ll play a certain sound effect. Or if the safety car comes on then I slow the music down and then bring the pace back up. That’s mad. So you’ve got to react pretty quickly and slow things down instantly but seamlessly? Yeah I usually do it on the breakdown and loop the beatless bit and bring the tempo down gradually. I’m watching race on the screens and I’ve got the race control coming through my headphones as well so I know how long the cars have slowed down for and I can make sure we’re looped out and built back up to the right speed when they’re racing again. So you’ve got info coming from all sides and you’re doing this with an audience of millions? 20 million viewers per race worldwide, yeah. No pressure then! But I have to say at the moment the DJ mix isn’t performed to that many people for licencing issues – that just gets performed around the track. But the build up to the race is DJ’d to that size audience and once we have all our own tracks written then I’ll be DJing live to the world audience every race. But just DJing trackside comes with a lot of challenges – sports don’t usually come with DJ booths so when we host a race in a hot country, for example, sometimes the DJ booth is set up so the sun is directly glaring into my visor so I can’t see the screens or my controls or anything! What’s the visibility like with the helmet anyway? It’s not bad when the sun isn’t shining through it. It’s very fine mesh so I do have to pay attention when I’m mixing using the computer. But we’ve never made any mistakes so it works! We’re debuting a new helmet this week actually which should make visibility even clearer. So back to the music, it sounds like you’re working with a team of producers to create an entire repertoire of music you can use throughout the sport? Yeah, I can engineer but there are a lot of really talented writers and a production team. It’s a fine line between making sure the tracks work for the race and shows I’m starting to play. Eventually we’ll be giving fans the option to choose how they watch the race – whether they want the commentary, my DJ mix or a mixture of both which is what we do at the track. The end result is a like a filmic soundtrack to the whole experience. Yeah I can hear filmic – it’s on that trance tip isn’t it? You can hear a lot more trancey elements in dubstep right now actually. You reckon we might hear some dubstep or D&B in your future mixes? There’s already both dubstep and drum & bass and all types of electronica in my global broadcasts which is on the global Formula E TV show. I know there will be more in the future, too. Last weekend I selected some up-and-coming talent for our music stage that was sponsored by Visa. We put three acts on both days – all up and coming, pretty much all unsigned. It’s great to have this platform to highlight new talent and then release it on Formula EPs. Luke Carey, who’s this amazing singer/songwriter has had a D&B remix of one of his tracks. So yeah, as we progress there’ll be all types of electronic music from a wide range of exciting emerging talent. Great…. So how do we deal with this helmet/anonymity thing? Are you actually a known DJ underneath it or not? I’ll leave that up for you to decide. I have been working in electronic music for a long time so maybe I am? Then again, maybe not. What’s most important for me is the music, the concept and what we’re creating. None of this has been done before, so who I am as an individual doesn’t make any difference and has nothing to do this. It’s really exciting and liberating to be in this position and be part of something that’s properly unique.